Making decisions about higher education can be a stressful time for students and parents, particularly those on expatriate assignments who often feel out of touch with university requirements in their home country or bewildered by global options. With a growing number of students exploring study options in the US, UK, Australia and elsewhere around the world it can be difficult to access and assess all the relevant information needed to make an informed decision, especially when many international school students apply to universities in multiple countries. ISKL offers a unique international curriculum for students aged 3-18 years which culminates in High School with a choice of taking the full International Baccalaureate Diploma Programme (IBDP) or the option of combining individual IB, North American Advanced Placement (AP) and High School Diploma courses to create an individualised programme tailored to abilities, interests and aspirations. Support is also provided to students taking worldwide university entrance exams to ensure the widest choice of options possible. In addition, ISKL’s language programme is designed to maximise opportunities. “Last year 20% of our IB Diploma students earned a Bilingual Diploma, which means they successfully sat IB exams in literature-level courses in two different languages. Our literature courses, available in Chinese, English, French, Japanese, Korean and Spanish show our commitment to mother-tongue learning." explains Mr Ortiz. 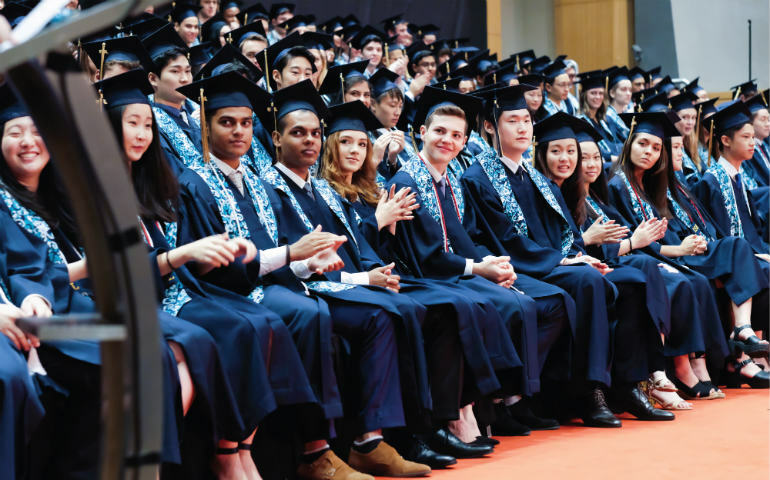 In keeping with ISKL’s mission to challenge students to “Be All You Are”, ISKL offers the IB Diploma Programme on a non-selective basis, working with individual students to develop an academic programme suitable to their goals, strengths and interests. Mr Ortiz continues, “often our greatest success stories are not those with the highest score, but those who challenge themselves the most, sometimes overcoming great odds to pass. While we are incredibly proud of our kids who earn a score in the 40’s, we are equally proud of the students who, through grit and perseverance, pass with a score in the 20’s. With a worldwide pass rate of 80%, just earning the IB Diploma is an accomplishment to be celebrated.” Undoubtedly, the experience and expertise of ISKL's teaching faculty play a major role in the success of our students. Overall 90% of ISKL’s faculty have a minimum of nine years teaching experience, 75% hold a Master’s or PhD and 40% of IB teachers are also IB examiners, responsible for marking exams from IB students around the world. ISKL students benefit greatly from this knowledge base as teachers apply their additional insights to classroom teaching and learning. Regardless of whether ISKL students elect to take the full IBDP or a combination of IB, AP and HS diploma courses, all High School students are empowered and encouraged to take leadership positions across ISKL’s extensive range of extracurricular activities, spanning service learning, clubs, sport, performance, art and music. “ISKL believes in the importance of hands-on experience as our High School students are responsible for running many of the clubs and events, participating in executive positions, running meetings and being accountable for outcomes. It is excellent preparation for university and the workplace.” says Mr Ortiz. In addition, all Grade 9-11 students participate in ISKL’s unique Global Action Programme (GAP) designed to build students’ awareness of emerging global issues by involving them in a range of cultural, environmental, and service opportunities within Southeast Asia. GAP’s unique experiential learning provides students with authentic opportunities to explore the physical and cultural environment of our region. While the GAP experience supports the ISKL mission of becoming “responsible global citizens”, student reflection upon their contributions to the communities they visit also supports IBDP requirements.